"Follow the Buzz" is one of the stories that toured from 2012-2013. This page is for teachers to use with their students to extend the learning experience and enhance their curriculum. The activities on this page are story specific and are designed as follow-up to the performance. Also see the Study Guide Main Page for activities to prepare your students for the show in general. Music and masks by Dennis; sets and costumes by Kimberly; props by Dennis and Kimberly. A poor worker has a dream of following bees, he sells the dream to his friend who sets out on a journey to discover what the dream means. He finds a rich man and gets permission to dig in his garden beneath the camelia tree. However the rich man tricks him and has his servant dig there first. They discover gold which the rich man keeps. The poor man only discovers a pot full of bees. However when he returns home his wife has had a similar dream also involving bees. Her dream leads them to discover the treasure (mostly books) that is hidden beneath their house. Have the students retell the story in their own words, pointing out the challenges the main character faces, how he resolves them, and what he learns in the end. One option is to have them tell the story in the form of a storyboard or cartoon. 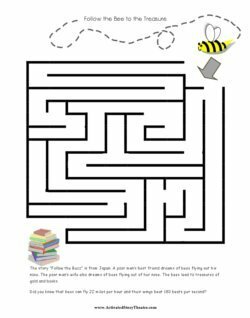 Download a maze for students to complete. Read the book The Bee and the Dream by Jan Freeman Long (Dutton Juvenile, 1996). How does this version of the story differ from ours? How is it the same? Have students examine the illustrations in the book and determine what scene each one depicts, and what each one suggests about the attitudes of the characters involved. a type of small flowering tree popular in Asia. One type of camellia produces tea. Can you think of other stories in which dreams played an important role? Locate Japan, which the Japanese call Nihhon, on the globe. Compare and contrast it to the United States. How big is it? (about the size of California). How does Japan compare to your state? Our production borrows elements from several types of traditional Japanese theatre. These theatrical forms tend to follow rather strict formulas in terms of plot, characters, and performance style. Kabuki is an elaborate performance spectacle featuring song and dance – the Japanese characters making up the word mean "music", "dance" and "skill", although the word may also come from word meaning "strange" or "unusual". These could be very long plays, sometimes lasting for an entire day! (Traditionally, however, the pace begins slow and steadily builds to a rapid conclusion.) The stages can be quite elaborate, with "special effects" built into them, and it's customary for the stage design to feature a walkway out into the audience on which some scenes are played. The actors wear heavy stylized makeup with a white base, deliver their lines in a monotone to musical accompaniment, and at times strike recognizable poses to identify their character types. Noh makes use of a smaller, less elaborate stage with wooden floors that are polished to allow the performers to make gliding movements, and constructed to resonate loudly when the performers stamp on them. 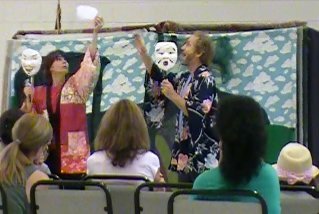 Traditionally, noh presentations also could take up an entire day, with more than one play performed; today, the practice is to perform two of them, with a comic Kyogen interlude. One noh play performed today is actually a translation of a play written in 1916 by Irish poet William Butler Yeats. The performers, who can include women, use a broad style in delivering their lines and making movements, accompanied by musicians. Only the main character (who is often a supernatural being) wears a mask, representing one of dozens of familiar character types. Kyogen ("KYO-gan") which means literally "wild words" or "mad talk", refers to a type of comedy that developed as an interlude between performances of the more serious Noh plays (or between acts of a single Noh play). Most kyogen plays are short, lasting 15 to 20 minutes, and feature a small cast, generally about 3 or 4, with male actors playing all roles, including female characters. The stories make use of stock characters (often, for example, a master and a servant). The performance style makes use of exaggerated, expressive gestures, and the plays are performed to music. Objective: The students will act out a familiar story in the style of Kyogen. They will focus on expressive gestures and exaggerated movement. Procedure: Discuss elements of the performance that were inspired by Kyogen. Break into groups of 4-5 and assign each cast a short story to perform. One person assumes the role of director at the beginning. The director calls freeze during the scene and tags one of the performers. The cast repeats the last line and makes the action even bigger. The person tagged is now the director. Each person must be the director at least once. Explain and demonstrate before breaking into work groups. Allow 5-10 minutes to rehearse in groups and then have each group present their story for the class.